Towards Disaster Preparedness Goal: Schools can play a major role! When I was small, I happened to go with my parents to different events and workshops related to disaster management. Due to this, I was aware of the disasters that could occur in my surrounding. When I was 5, we went for a beach holiday. As I knew about tsunamis due to the Indian Ocean Tsunami just a few years before then, I was not ready to go into the sea. Whenever the water moved backwards before the waves formed, I thought a tsunami was coming and ran away. Even though I knew about disasters, I was not aware of their intensity and seriousness. Whenever an earthquake occurred, I quickly ran under the table and followed `Duck, cover and hold’ that I had learnt from some story books and videos. My mother used to say, “ducks under the tables” and I used to take cover. When I was a little older, I started to try and help people who were affected by disasters by donating from my pocket money, and collecting funds from others to donate for the affected people. I always thought that there were only two types of people, the affected and the donors. I never thought that the helpers or the donors could also get affected someday. As a young boy, I thought that I was totally safe, but I was wrong! Disasters can strike anywhere and affect anyone, educated or uneducated, urban or rural, rich or poor. During a visit to Myanmar in June 2016, we went to world famous tourist attraction and place of worship called Bagan. 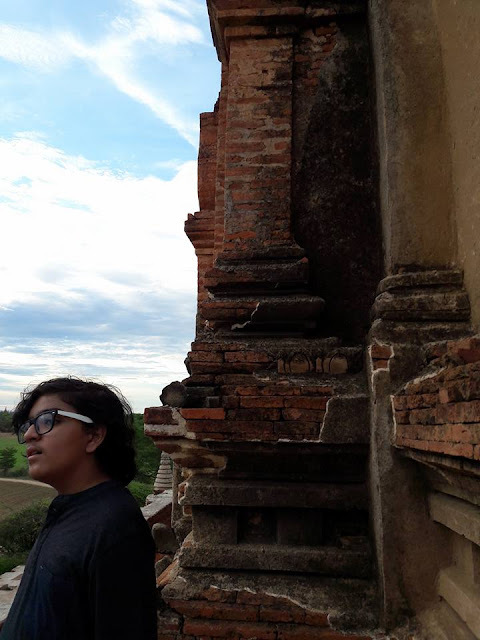 We saw many ancient pagodas and temples. 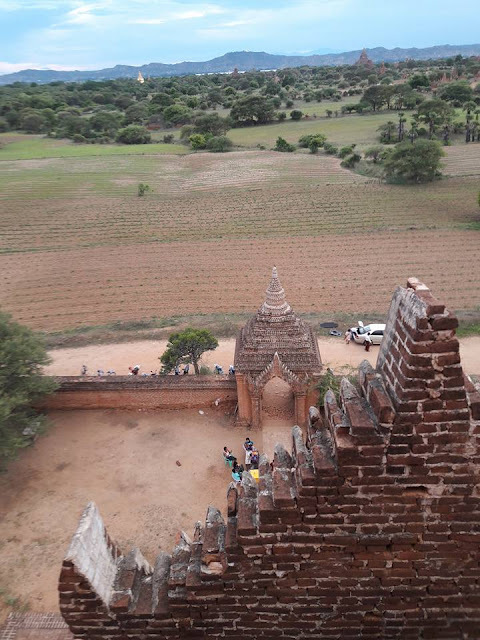 Bagan is in an active earthquake zone and has a history of many earthquakes. In 1975, a major earthquake had occurred there and we saw the pagodas that had been damaged by it. Many structures were tilted and some parts were broken down too. We went to see spectacular sunset from atop a very high temple called North Guni. We walked up narrow steps and under very low arches to reach the top where many tourists were sitting at different levels looking at the sunset. Here too, we saw tilted structures and my mother asked what if an earthquake happened while people were atop. The very thought was very scary and made me feel very vulnerable. After just two months, Myanmar was hit by an earthquake of 6.8 magnitude and that very temple was amongst many that were affected. To see pictures and videos of the tumbling pagodas affected me and I realised, even as a tourist we are exposed to the disaster risks. When I had not read much about disasters, I thought only phenomena like earthquakes, hurricanes and tsunamis are considered disasters, but disasters occur on different levels. They can occur in a family, a society, a state, a country or even the world. In many cases they can also affect schools. We have learnt at school about disasters and their types as natural or man-made, mitigation and prevention. Yet, I feel, I need to know a lot more about them and how to be prepared. We live in Gurgaon and many of my friends live in high rise buildings. Some schools have fire drills and earthquake drills but many a times they are not done. Also, somehow, we the children tend to not take the drills seriously because we think it will not happen to us. In school, sometimes, small children ring the alarm and run away. Thus, we take the drills and alarms very casually. We need to learn about the safety aspects and preparedness in our school buildings, on way to home from school and at home. We need to discuss in case of a calamity, if our family is at different places like office, school and home, how and where will we try to meet in case communication lines are down. 1.Comments will be moderated by NDMA's editorial team. 2.Comments that are abusive, personal, incendiary or irrelevant cannot be published. 3.Please write complete sentences. Do not type comments in all capital letters, or in all lower case letters, or using abbreviated text. (example: u cannot substitute for you, d is not 'the', n is not 'and'). 4.We may remove hyperlinks within comments. 5.Please use a genuine email ID and provide your name, to avoid rejection.